Even the most practiced of us all can’t claim 100% diaper changing perfection. Leaks, blowouts, rashes, and more always seem to bring on all sorts of new colorful surprises. But there’s no need to get too frustrated! Here are 10 amazing game-changing tricks and products that will make changing diapers super easy. One of my sons was a heavy wetter at night time. A single diaper was just never enough. Keep bottoms, clothes, and bedding dry by doubling up on protection. Crib liners are a good option, but you can always just slap 2 diapers on your Little Fire Hydrant as well. I recommend this Carter’s crib pad from Amazon. With some babies, diaper changing is just a struggle. I’m not a singer by any means but I always found that singing or humming a little tune always seemed to comfort my boys when they were fidgety during diaper changes. The tune itself doesn’t matter so much as long as it’s something that can distract your little one. Check out these recommendations on YouTube. Hang a super functional pegboard changing station to keep all your diaper changing needs close at hand. Different hooks and attachments can be used to hang a variety of shelves, baskets, and decor. I would never want to leave my child messy when they have an accident. However, there are just those times when you can’t immediately change a diaper. The worst is when you’re somewhere that you can’t really change a diaper and Baby has a full-on blowout! If you’re headed out and know you need some extra security in case you have one of those accidents, try a Blowout Blocker to protect from major mess. A diaper bag that converts into a changing station?! Yup, that’s right! This 2-in-1 bag not only holds and carries all your supplies but it also unfolds into a sturdy changing station that will keep Baby off the ground, dirty counters, and more. That really IS a life changer! Having an object to hold is sometimes all it takes to keep Baby calm and distracted while you change out a dirty diaper. Keep special toys near your changing station that come out only during diaper changes. You’ll also want something that’s easy to clean like these super adorable plush animals from The Baby Cubby. If you’d like to peace of mind that Baby is growing strong and healthy, the HatchBaby changing pad is just your thing! When my niece’s little girl was born premature, the HatchBaby made it easy to track positive growth while Baby was already down for changing time. No need to make Baby go through uncomfortable weigh-ins when it can be done as part of the normal daily routine! The associated app makes tracking data super easy! Keep Baby distracted during diaper changes with a mirror so she can look at herself. After all, it’s never too early to start admiring all those adorable qualities in herself! Amazon has a nice selection of baby mirrors here. Keep a small spray bottle with your changing gear to make cleaning messy bums much easier on you and Baby. Fill the bottle with water and just a few drops of baby oil to do a proper job without irritating Baby’s skin. Find the perfect spray bottle for your gear right here. 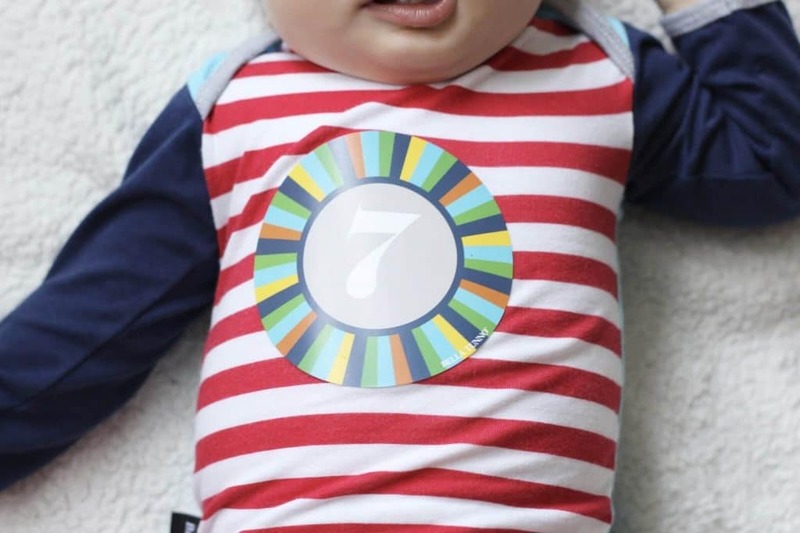 Right before you start changing Baby’s diaper, put a brightly colored sticker on his shirt and he’ll spend the next few minutes trying to figure out how to get it off. Just be sure to take the sticker away when you’re done so it doesn’t end up in Baby’s mouth.